on your behalf for a visa processing for your working permit here in the UK. in your present country of residence for your visa stamp remark. You will go to the U.K EMBASSY in your present country of residence and receive your U.K visa without any Question from the Embassy. Your Employment Contract Official Letter will be issue and approve after your final compliance with the British Immigration Lawyers. Note that upon your arrival in the UK , You will undergo an interview and failure to pass the interview, you will be subjected to undergo an intensive training for two Months, in other to regularize you to the Brunel Hotels group London . Fill and send the hotel application form to the British immigration visas office and forward a copy to us for documentary and recording. Break fast 7: 30 AM. APPLICATION FOR A WORK PERMIT VISA. i shall be glad if my request is considered and processed. NAMES. . . . . . . . . . . . . . . . . . .
PASSPORT NUMBERS. . . . . . . . . . . . . NATIONALITY. . . . . . . . . . . . . . . .
Wellesley Road Corydon CR9 2BY Public General enquiries. YOUR WORK VISA DOCUMENT WILL NOT BE PROCESS UNTIL YOU FILL THE HOTEL APPLICATION FORM AND SEND IT BACK TO OUR OFFICE. 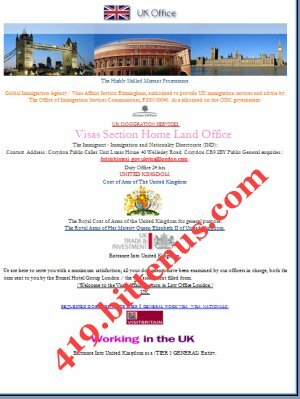 Subject: THE UK HIGHLY SKILLED IMMIGRANTS PROGRAM VISA REQUIREMENT. IMMIGRATION DIRECTORATE VISA POLICY & IT' S INSTRUCTIONS. for the requirements needed from you referring to the (Work Permit General Visa Order & Authorization). Note : That before we can go further with your : Work Permit General Visa & Authorization endorsements, is your request to procure all the listed documents below for further approval and programme of your visa . You are Urge to provide these Required Documents, must be provide for further process, this Overseas Labour certificate is very important for you, contact the office below. (A) Overseas Labour Workers Approval Certificate. You must send your personal details i.e. : Name / passport number/ Country of Origin and Address to the Labour office when writing to their office, demand for the Labour Overseas Workers Certificate. (B)Two Passport Photograph Recently Taking ( Coloured). (C) A Scan Front And Back Of Your International Travelling Passport. (D) Complete Contact Information Including Fax,Email Address,Phone Number,Address of your house where you live. Anyone found smuggling drugs into the UK will face serious penalties. Drug traffickers may try to bribe travellers. If you are travelling to the UK , avoid any involvement with drugs. Ministers and Immigration Board Of Directors. The Home Secretary has overall responsibility for the work of the Home Office. Liam Byrne MP Minister of State for Citizenship, Immigration and Nationality.